Since the beginning of April, I’ve been participating in a Pinterest challenge with a bunch of other bloggers. We are all experimenting to see if we can get our blog’s traffic from Pinterest higher. Now, if you have spent as much (or any) time on Pinterest as I have, you’ll no doubt have noticed trends in popular Pinterest ideas. Salad in Jar, for example, is one of those ideas. Others include hassleback potatoes, monkey bread, and, of course, loaded baked potato soup. 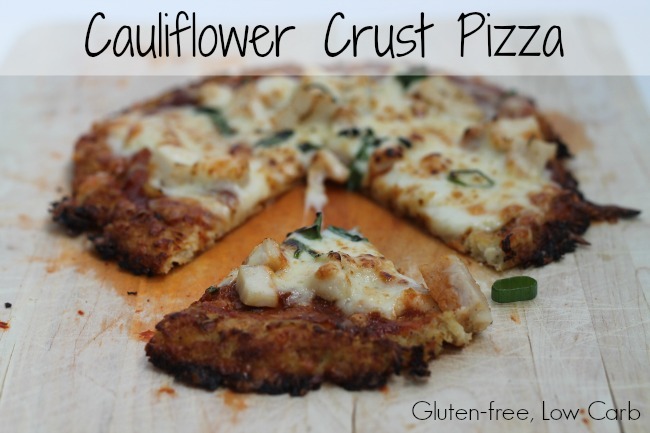 One of the current trends I keep seeing time and again flying past on Pinterest is the Cauliflower Pizza Crust. Now, in case you’ve not heard of the Cauliflower Pizza Crust, and wondering what the heck it is, the name pretty much says it all. It’s a pizza crust. Made of cauliflower. Yeah. Why, right? Regular pizza crust, if done right, is delicious! Well, first off, there are some folks out there who are, first of all, gluten intolerant. Secondly, a bunch of folks out there are focusing on lower-carb diets, which means cutting out things like wheat, and substituting, if possible, with vegetables (see the popular rise of “zoodles“–zucchini put through a spiralizer to make noodles) for pasta. Now, you might be asking, “but how does it taste?” Good question. And the answer is, surprisingly good! I made this for the 11-year-old, and he liked it. And you have to understand that the 11-year-old’s favourite food of all time is pizza. He would eat it three times a day if I let him. And let me tell you–any extra vegetables I can squeeze into his body, I will take the advantage to do. The trickiest thing with this recipe is getting it dried out enough. You really have to watch it, because it’s easy for this to still be so wet and mushy in the middle that it becomes almost impossible to lift it off of the pan. I’ve tried a few different recipes out, and the one that’s worked best for me so far is the one that gets you to bake the cauliflower after ricing or grating it (most recipes get you to cook the cauliflower in the microwave). You also need to put the cauliflower in a cheesecloth and really, really wring the crap out of it, to get it as dry as possible. Finally, one last tip I have for you is to keep your pizzas small; think individual portion size, not giant family sized. This way, there’s less middle to cook. Cut the cauliflower in half, and then cut out the core. If you are using a food processor, chop into florets, then place in the food processor and pulse until the cauliflower looks like rice. If you aren’t using a food processor, don’t cut into florets, and use a box grater to shred the cauliflower. Measure out 2 1/2 to 3 cups of the cauliflower “rice.” Spread it in a single layer on a parchment-lined baking tray, and bake in a pre-heated 425 degree oven for about 10 minutes. Remove from the oven and allow to cool so you can work with it. Place a colander over a bowl, and then line the colander with a cheesecloth or a tea towel. Place the cauliflower in the cheesecloth, make it into a bundle and squeeze as much liquid as you can out of it. You can also place in the fridge overnight with something heavy on it, but you’ll still probably have to do some squeezing. You want to get it as dry as possible. Place the dried cauliflower in a bowl with the rest of the ingredients, and mix well. Form into round pizza shapes on a parchment-lined baking sheet, or use your pizza stone (if you have one). If you use your pizza stone, you’ll still need the parchment. Bake (at 425 again) for at least 10 minutes, or until it starts to brown. For extra dryness, flip, and allow to bake on the other side as well. Once the crust is golden, you can remove it from the oven, and top it with your fave pizza ingredients. Return it to the oven for 5-7 minutes, until the cheese is melty and good. Remove from oven and serve!